[2017/04/23]Upgrades your PC/Mac, Smartphone and Tablet to be a hi-end audio source! Trends UD-10.1 Lite USB audio converter plugs into your PC/Mac's USB port or Smartphone and Tablet with a OTG cable and lets you connect your computer, Smartphone and Tablet to your Hi-Fi or Home Cinema system easily, and with high sound quality.These are the four main uses for the Trends UD-10.1 Lite USB Audio Converter. "I've been using this versatile little box for a couple of months now. It took me all that time to fully appreciate its charms. It performs more functions than any under $110 device I've ever seen. Not only does the UD-10 allow you to convert a USB audio signal to multiple Coaxial, Toslink, or AES/EBU digital outputs, but it also delivers an analog signal. Either a USB connection or an external battery can power the UD-10.... "
"...The sound was clean, detailed, and harmonically well balanced. When I compared an analog feed from the Meridian 561's tape outputs to the Trends UD-10 I discovered just how amazing the UD-10 really is ?I couldn't tell any difference. This is one very good little D/A!" "For $110 I dare anyone to find an audio device that does so much so well. The Trends UD-10 is simply a must-have for anyone with a computer-based recording or playback system"
Hearing is believing! 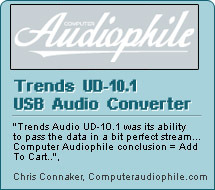 Please Contact an Authorized Trends Reseller or Trends Audio Sales,alternatively you may Login to the Customer Area and order Trends UD-10.1 Lite USB Audio Converter today. [2017/04/21]Get a FREE La La Land Blu-ray + OST for ordering Trends PA-10 Tube Headphone/Preamp! Trends Audio partners with Buyoyo.com, one of the largest Internet online retailers of Chinese Books and Entertainment products in the world and provide a FREE La La Land Blu-ray + OST for ordering Trends PA-10 Series products from now to May 30, 2017. Trends PA-10 Tube Headphone/Pre Amplifier is an innovative audio product and provides all functions of headphone amplifier and pre-amplifier. It includes the innovative circuit design of low voltage hybrid (tube/transistor) pre-amp to provide audiophile quality sound, compact size, and easy/safe DIYer accessibility - pure class-A circuit to provide the best sound performance and have fun tube rolling with this fantastic headphone/Pre amplifier. Hearing is believing! 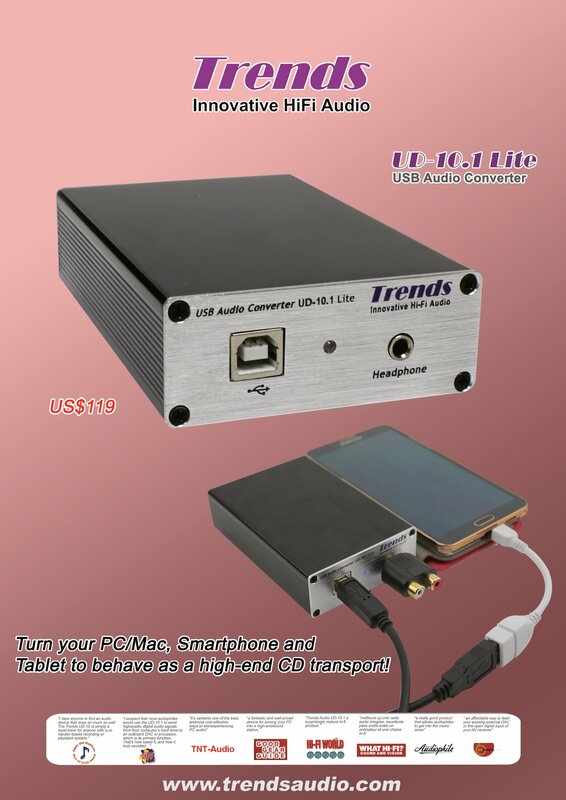 Please Contact an Authorized Trends Reseller or Trends Audio Sales,alternatively you may Login to the Customer Area and order Trends TA-10.2 Class-T Stereo Audio Amplifier today. "…First up with the vintage RCA 12AU7 black plate inserted was Jorma Kaukonen's "Blue Country Heart". As you may know if you've read some of my other reviews, this is one of my favorites that I like to include in my evaluation tests for it's impeccable acoustic American roots music, not to mention the terrific quality of the recording. It was immediately evident that the PA-10 running with the 12AU7 was much warmer, more laid back and less dynamic without sacrificing much in terms of detail. The 12AU7 did a much better job in terms resolving the vocal performances on this recording than the 6H23N, which portrayed the vocals with more color, and the trumpet sections during some songs were a bit too forward. I love this recording, and thoroughly enjoyed listening to it through the PA-10. Hearing is believing! Please Contact an Authorized Trends Reseller or Trends Audio Sales,alternatively you may Login to the Customer Area and order Trends PA-10 Tube Headphone/Preamp today. [2017/04/03]Select the Easter Gift for music lover 2017 at Trends Audio! Raved by reviewers, audiophiles and music lovers worldwide, the award-winning Trends TA-10 is widely considered the best sounding (and best value) among Class -T amps. Thanks to the Tripath's proprietary Class-T Digital Power Processing (TM) technology and our special techniques in circuit design and component selection in Tripath TA2024 IC, TA-10 achieves the sound quality of high-end but in a very affordable price. "The little Trends amp surprised the hell out of me. And not just because of its size (though it is smaller than I even imagined), but because it makes such beautiful music..., If I can't hear the difference between a $150 amp and a $1500 amp, something must be wrong with me! " Hearing is believing! Please Contact an Authorized Trends Reseller or Trends Audio Sales,alternatively you may Login to the Customer Area and order Trends TA-10 Class-T Stereo Audio Amplifier today.